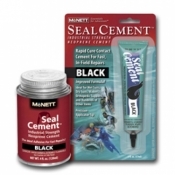 You are purchasing Seal Cement in BLACK and in a 2 fl. oz size tube! Shake tube well before using! Close tube to neck and cap securely! To promote longer product life, always store tube in a cool, dry place with the tip end down! Original package blister card may be used for storage. Need to do High Speed, Field Repairs this could be the product for you! California WARNING: Using this product will expose you to toluene, a chemical known to the State of California to cause birth defects or other reproductive harm www.P65Warnings.ca.gov. For more information visit the Prop 65 Frequently Asked Questions page.